Titania McGrath (@TitaniaMcGrath) is a parody Twitter user and author created by comedian and Spiked columnist Andrew Doyle. She is a social justice warrior who promotes extreme identity politics and political correctness on her Twitter account. McGrath characterizes herself as a "radical intersectionalist poet committed to feminism, social justice and armed peaceful protest," while her creator describes her as "a militant vegan who thinks she is a better poet than William Shakespeare." Doyle has written a book, titled Woke: A Guide to Social Justice, under her name, which was published on 7 March 2019. The character has received polarizing, though mostly positive, reviews from critics and had more than 200,000 followers as of March 2019. Titania McGrath is a fictional 24-year-old "radical intersectionalist poet committed to feminism, social justice and armed peaceful protest" who identifies as non-binary, "polyracial" and ecosexual. In an interview with The Spectator, the persona revealed that she was raised by parents who "lavished" her with "gifts and money" in order to distract her from her "oppression." She became woke through the Bible passage of the Cleansing of the Temple, which inspired her to "a similar thing" at the age of four at her local branch of HSBC. She studied Modern Languages at Oxford University before completing an MA in gender studies for which she wrote "a groundbreaking dissertation on technopaganism and the corrosive nature of cis-masculine futurity." On her Twitter account, McGrath promotes extreme identity politics and political correctness, and comments on various topics, notably Brexit, LGBT issues, feminism and American politics. 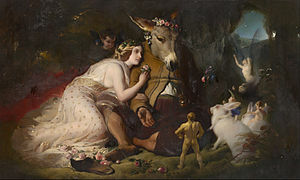 Titania McGrath is named after Titania (pictured), the queen of fairies from William Shakespeare's A Midsummer Night's Dream. Andrew Doyle, the creator of McGrath, describes her as "a militant vegan who thinks she is a better poet than William Shakespeare." He revealed to The Daily Telegraph that she is named after Titania, the queen of the fairies from Shakespeare's A Midsummer Night's Dream, as he believes that "all of this 'woke culture' is an utter fantasy world." He added "The people who promote this hyper inclusive culture are fantasists [...] so [he] think[s] it's quite appropriate that she is named after the queen of the fairies." McGrath has been compared by journalists at The Conversation and the Irish Independent to the work of several satirists from the 18th century, such as Jonathan Swift's Isaac Bickerstaff, who published an almanac in February 1708 predicting the death of the controversial social commentator, John Partridge, who had offended many with his criticisms of the Anglican Church. On 31 March of that year, Bickerstaff declared Partridge dead, and he was believed by the public. Consequently, when Partridge awoke from his sleep on 1 April he was met with questions about his own funeral, prompting him to publish a pamphlet asserting that he was indeed alive. The journalists suggest that McGrath, much like Swift, was created to criticise those with views the creator disagrees with in a manner which would not be possible without anonymity. The account's creator, Andrew Doyle, is a 40-year-old (as of March 2019) comedian, columnist for British internet magazine Spiked and former Oxford University postgraduate student and private school teacher with a doctorate in Early Renaissance Poetry from Wadham College, Oxford. He is also the co-writer of fictitious news reporter Jonathan Pie. Doyle created the account to mock contemporary "woke culture," as "the majority of people are desperate for this culture to be mocked"; he subsequently created an anonymous Twitter account for his fictional character, Titania McGrath, in April 2018. McGrath's Twitter account was suspended for hate speech four times, notably on 9 December 2018, only for it to gain 20,000 followers after it was reinstated a day later. As of 10 March 2019[update] her account has 205 thousand followers. On 7 March 2019, McGrath published her first book, titled Woke: A Guide to Social Justice. A tweet she had posted promoting the book appeared in Private Eye's "Pseuds corner". The post read "I have written the most important book of 2019. Do not buy it for my sake, but for the sake of humanity." Within a few days of its publication, Woke was among the 100 most sought-after books on Amazon, and the number of followers on McGrath's Twitter account went from 150,000 to 228,000. In March 2019, Doyle was contacted by Rosamund Urwin, a journalist at The Sunday Times, who asked whether he was the person behind McGrath's Twitter account, due to the inclusion of several sources in McGrath's book that he had quoted previously. Though he denied it, he later revealed himself as the man behind the account. Beforehand, there had been speculation that several people including Chris Morris, Ricky Gervais, Ann Coulter and even Urwin herself were behind the account. Titania McGrath's character has received polarizing, though mostly positive, reviews from critics. Janice Turner of The Times praised the author in her review of Woke for "perfectly captur[ing] the chiding, self-righteous, intolerant, joyless tone of the "woke"", and added that though "the politics can be heavy-handed, [...], its satire is a direct hit on the awful state of the left, in all its nihilism, narcissism and illogic, and its self-defeating, petty-minded thought policing. Woke is no joke." Patricia Casey of the Irish Independent hailed McGrath's tweets as "outrageous and hilarious", leaving her "addicted, hooked, devoted." The New Criterion praised Doyle's satirical humour, writing that "blessed with a pitch perfect ear for absurdity, [he] has revealed the malign hilarity of woke culture." Emily Sheffield, writing for the Evening Standard, called McGrath's book "hilarious," though "in book form [...] the parody becomes repetitive." However, she added that "Virtuousness, virtual or otherwise, is an easy target. Being woke even simpler to satirise." Charles Moore of The Spectator called the character "genius," and praised her tweets. Shappi Khorsandi, in an article for The Independent, compared McGrath favorably to Millie Tant from the comic magazine Viz, and stated that McGrath "pricks pomposity and tempers moral certitude with a hint of doubt; in short, she keeps us honest." Neil Mackay of The Herald wrote that Titania's book "mercilessly satires the Left's online umbrage brigade, the permanently offended, those who have taken on the role of policing thoughts and words to the point of absurdity", adding that Titania's targets "need mocked" as they "make good causes look ridiculous, they alienate when they should be persuading, and they turn liberalism – which I hold dear – into something stupid." Conversely, Alex Clark of The Observer criticised the character, stating that "lampooning the language of social justice is a cheap shot," and that "it doesn't get us much further than the temporary glow of self-praise, and it certainly doesn't get us off the bus to hell." Mollie Goodfellow of the New Statesman echoed these views, stating that McGrath "simply isn't that funny," and suggested that her target audience are "the people who claim "you can't say anything anymore", even as their opinions are repeated constantly on national TV, in the papers and online," and "who question whether feminism has "gone too far" and say "people will be offended by anything these days", just after saying something offensive." ^ Urwin, Rosamund (3 March 2019). "Woke Twitter spoof Titania McGrath might be a man". The Sunday Times. Archived from the original on 3 March 2019. Retrieved 10 March 2019. ^ a b Doyle, Andrew (4 March 2019). "'I am not Titania McGrath. Go f**k yourself'". Spiked. Archived from the original on 5 March 2019. Retrieved 10 March 2019. ^ a b Gold, Tanya (2 March 2019). "'Brexit shows democracy doesn't work': An interview with Titania McGrath". The Spectator. Archived from the original on 10 March 2019. Retrieved 10 March 2019. ^ Grant, Madeline (11 December 2018). "Twitter's latest suspension proves motive doesn't matter anymore". Institute of Economic Affairs. Archived from the original on 17 December 2018. Retrieved 10 March 2019. ^ a b "Woke's on you". The New Criterion. April 2019. Archived from the original on 1 April 2019. Retrieved 1 April 2019. ^ a b c d Lyons, Izzy (6 March 2019). "Titania McGrath: 'Queen of woke Twitter culture' sheds his online mask". The Daily Telegraph. Archived from the original on 6 March 2019. Retrieved 10 March 2019. ^ Smith, Adam J; Waugh, Jo (15 March 2019). "Titania McGrath: Twitter parody of 'wokeness' owes a lot to satirists of the 18th century". The Conversation. Archived from the original on 19 March 2019. Retrieved 14 April 2019. ^ a b c Casey, Patricia (23 March 2019). "How Titania 'woke' me to the social justice warrior crusade". Irish Independent. Archived from the original on 1 April 2019. Retrieved 1 April 2019. ^ a b Turner, Janice (8 March 2019). "Woke: A Guide to Social Justice by Titania McGrath review — how to be a modern leftie". The Times. Archived from the original on 8 March 2019. Retrieved 10 March 2019. ^ Doyle, Andrew (25 November 2016). "Jonathan Pie Said The Left Was Wrong, Not The Right Was Right". HuffPost UK. Archived from the original on 26 November 2016. Retrieved 17 March 2019. ^ Turner, Janice (8 March 2019). "Woke: A Guide to Social Justice by Titania McGrath review — how to be a modern leftie". The Times. Archived from the original on 8 March 2019. Retrieved 10 March 2019. ^ Elfwick, Godfrey (10 December 2019). "Welcome back Titania McGrath!". The Spectator. Archived from the original on 3 February 2019. Retrieved 10 March 2019. ^ "Titania McGrath on Twitter". Retrieved 10 March 2019 – via Twitter. ^ "Woke: A Guide to Social Justice". Amazon. Retrieved 10 March 2019. ^ a b Moore, Charles (9 February 2019). "The genius of Titania McGrath". The Spectator. Archived from the original on 10 March 2019. Retrieved 10 March 2019. ^ Sheffield, Emily (8 March 2019). "Poke fun at 'woke' Titania — but getting virtuous now and again is better than cynical inaction". Evening Standard. Archived from the original on 10 March 2019. Retrieved 10 March 2019. ^ Khorsandi, Shappi (14 December 2018). "Scrap comedy 'safe spaces'. Satire keeps us honest". The Independent. Archived from the original on 14 December 2018. Retrieved 24 March 2019. ^ Mackay, Neil (12 March 2019). "We need to stand up to the tyranny of the thought police". The Herald (Glasgow). Archived from the original on 1 April 2019. Retrieved 1 April 2019. ^ Clark, Alex (10 March 2019). "Titania McGrath: laugh if you want, but woke's no joke". The Observer. Archived from the original on 10 March 2019. Retrieved 10 March 2019. This page was last edited on 19 April 2019, at 15:11 (UTC).